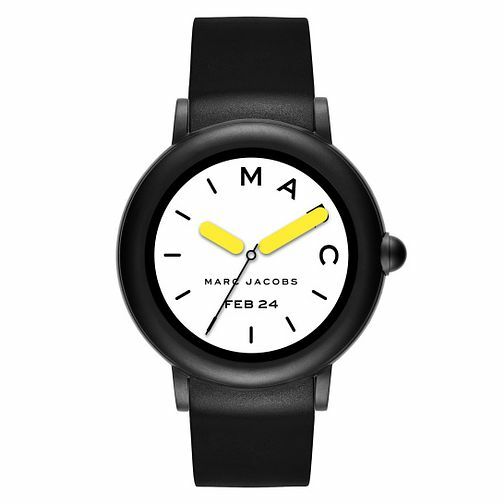 From the Riley collection by French fashion house Marc Jacobs, this stylish timepiece flaunts a black case, and a beautifully complementary black silicone strap. In addition to being a show stopping fashion accessory, this touchscreen smartwatch also has a number of impressive features. The Riley touchscreen smartwatch is compatible with both IOS® and Android™ phones, powered with the Wear OS by Google™ smartwatch platform. The smartwatch connects to your phone via Bluetooth and offers user friendly notifications, messaging and downloadable third-party apps. Receive calls and texts, access your music library, track you daily steps and calories and much more with this smartwatch perfect for the fashion forward modern-day woman.